Picking fonts to use on your website can be hard enough, but once you’ve chosen Google Fonts, you may be left confused about how to use them on your site. between the <head> and </head> tags. immediately below the comments declaring what theme it is and such. Open your child theme’s header.php and add the code between the <head> and </head> tags. So, which is the best way to add Google Fonts to your site? The standard way to include webfonts will have the least impact on the speed of your site. On slow connections though, visitors to your site may see the so-called Flash of Unstyled Text (FOUT), your text will show in a diffent font, then switch to your Google font once that has loaded. The @import way will prevent that, but may slow down your site because it’ll wait for the font to load, then show the content. Standard is standard for a reason. It’s most likely the best way for you to include the fonts on your website. It’s better for visitors on slow connections to be able to at least see & read the content, than to have them wait longer until the included font has loaded. 1. Combine multiple fonts into one request. 2. Don’t ask for fonts you don’t use. This may seem obvious, but if you don’t actually use a font, don’t include it. Some browsers only load the font files needed to render the text on the page, but others will load all fonts included, which will slow down your site. So far, we’ve actually only added the fonts to be able to use them, but they won’t show up until you tell them where to show up. Save the files you’ve edited and upload to your site. You may also like to use your chosen Google fonts in your images, to make them match the rest of your site. 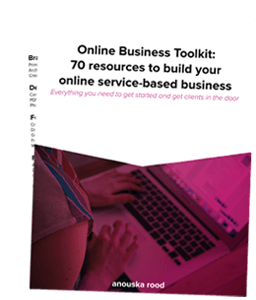 Sign up below to get your Online Business Toolkit – with 70 tools every online service-based business needs!